Stitch isn’t just any dog, he’s a resilient underdog. 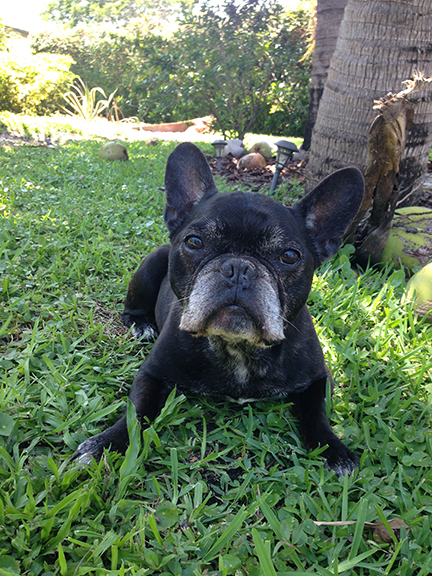 He’s a 14-year-old French bulldog who has bounced back from multiple health adversities with the help of the amazing Dr. Anthony Krawitz. Stitch is a super-smart boy who loves to go on road trips, tear up wrapping paper and cardboard boxes, and remove caps from empty water bottles. He likes trips to the park, massages, belly rubs and sweet potato treats. He spends time hanging out on his chaise lounge with his brother, Gonzo, and most of all, he loves grooming his sister, Lilo. He’s a talker who will let you know you all about his day in his special “Abba, Abba, Abba” way. Stitch is especially unique, full of personality and truly one of a kind! Congratulations to “STITCH” and The Carmichael Family for being voted Calusa’s June 2018 Pet of the Month!